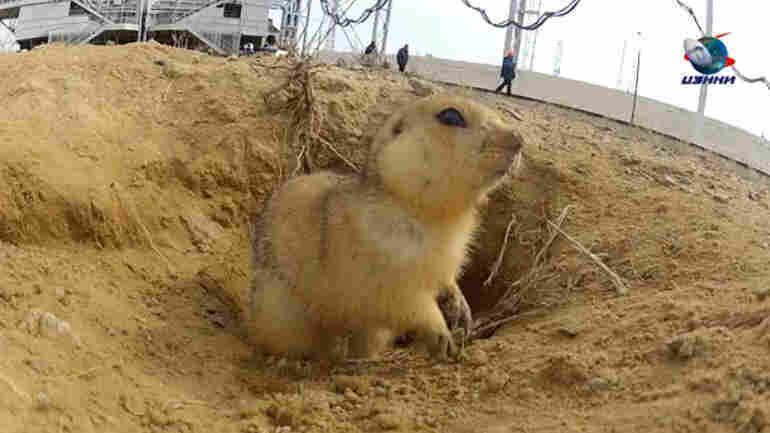 Weekend Special: Curious Kazakh Gopher Not Curious About Nearby Spaceships : Krulwich Wonders... He's compact. He digs. He's careful. He inspects everything. This is exactly the kind of Earthling I'd want to send to a nearby planet. How he got to live there, I don't know. For one thing he's a gopher, not a cosmonaut or a rocket engineer, just an ordinary Kazhakh rodent who dug himself a hole. The hole, however, is smack in the middle of a rocket launching facility, one of the most active spaceports in the world, called the Cosmodrome. Located in Baikonur, in Kazhakhstan, this is the place that launched Sputnik in 1957, sent Yuri Gagarin into space in 1961, services Soyuz with multiple launches ever year. It's busy, noisy and it's dangerous — one would think. But take a look at this gopher. He (she?) seems more than comfortable. Giant platforms roll overhead — not a problem. Huge tall things loom nearby — so what? People come close. Does he care? No. But when someone sets a camera at the entrance of his home, suddenly he's Mr. Curious. He sticks his eyeball against the lens. He tries to chew the glass. He sniffs everywhere. Looking at him, I can't help but think "this is exactly the kind of Earthling I'd want to send to a nearby planet." He's compact. He digs. He's careful (often standing stock still, to make himself invisible), and he inspects everything. Plus, being smaller, his spacecraft, space suit and space diet (sunflower seeds in a large bag) represent a significant cost savings...if he'd go. But he seems so happy in his hole, I wonder: Do ground-dwelling rodents ever dream of the stars?